What issue am I looking at here? Perfect adhesion on the base plate (cf second attachment). First three(ish) layers print fine. Then filament gets completely trashed around layer 5. Nozzle is still perfectly clean, so it does not look like a delamination issue. This started at my second print with a new roll of Yellow PETG. The printer was previously calibrated and printing PETG (galaxy black, green) down to 0.10 mm without issues. The printer stands in a ~16-19C hallway, no enclosure, somewhat protected against draft. This happens for default PETG settings, default with reduced flow rate, and my own custom settings that worked well. I usually print PETG with a high retraction rate around 1-1.2mm. I mention this because this too is a layer 3-5 problem. From the looks, I was first thinking that the nozzle was either too close to the previous layer, or too far, resulting in a sparse layer. However I cannot see evidence of physical dragging (i.e. filament sticking to other parts of the nozzle). The more I'm thinking about it, I wonder if heating fails around the time where I adjust temperature from previous layers. That could be either because of the fan starting (though it should start earlier), or because of a software issue when adjusting the temperature (like in the github issue). 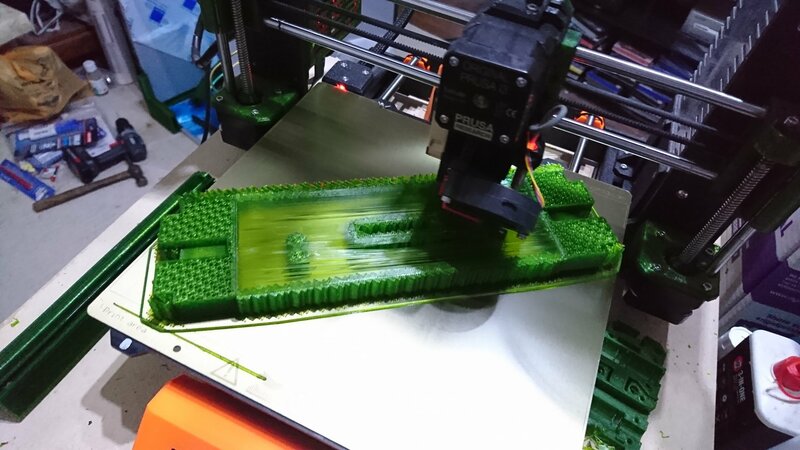 It could also be a combination of [new nozzle, high retraction, additional cooling setting in around layer 3]. I will investigate those more, I was just wondering if it looks like a known symptom or issue to you. Many things it could be. All you can do is begin a process of elimination. You still have a hardened nozzle in, yes? Well, there's the first thing to swap out. Go back to default PETG settings. What happens then? Infill issue? Try a different type. I agree that it is probably the nozzle causing issues. My suspicion is that it is just cooling down much faster than the brass nozzle whenever the fan is enabled. I also wonder if the temperature raise at layer 3 is causing an issue, not because the temperature is rising, but because the print is waiting for the nozzle to have reached the target temperature, despite the fan starting to run. However since the first layers print fine, it is perfectly possible to get decent results out of the nozzle. I will try first to print with a constant temperature and reduced fan speed. The print above is with default PETG settings and 0.9x extrusion factor. 1.0x looked similar. So yeah, it looks like the issue manifests first with infill. The first print (star shape) looks fine, but there is almost no infill that could get shredded. You will also notice that the first five layers are almost transparent, while the rest becomes opaque. Is that because they are still heated by the bed, or is it a symptom of high/low temperature? I tried another print with the fan disabled, and no temperature changes. Results are better, until we get to the infill. Already the first layer of infill seems to have both broken strings and blobs. I will try another test with default retraction. Yes, I could probably switch back to the old nozzle, but since I know I have been printing more complex prints with black PETG on that nozzle I'm still boggled that just changing to yellow should mess things up that badly. Don't worry, reason will settle in soon. Looks similar to a problem I had when I was dialling in Rigid Ink PETG. The solution was to lower the infill speed. to 67mm/s. Rigid Ink actually list 70mm/s as the maximum extrusion rate for their PETG. Increasing the extruder temperature does not help as the filament be comes too runny and oozes everywhere. This is a case where just lowering the volumetric setting just does not really do anything and a speed reduction is the way to go. That way if a larger nozzle is fitted the setting will still work. I will try and distill the best strategy out of all these. Infill speed seems to be a common denominator, and maybe the changed pattern to prevent buildups. I am glad that helped. I forgot to mention that I use gyroid as my infill pattern but any pattern that avoids crossing on the same layer will help. So, I managed to produce a (somewhat) clean print. First, another three attempts failed horribly. I had set the infill speed down to 80mm/s, chosen a honeycomb infill pattern. No gain. But the third failure showed me something: I was working with the standard PETG settings, only removing the temperature raise to avoid the software bug. Now, the second the fan started to operate, the layer it was on tore up. That was one or two layers *before* we even reached the infill pattern. The successful attempt then was with the fan turned off. As suspected, things got a bit more oozy, but the thin walls of the infill pattern deposited surprisingly ok. I will have to do some measurements to see if maybe the whole structure sagged when the print has cooled. If it is really the fan / excessive cooling causing the filament to tear or clog, I can try slowly rising both fan speed and nozzle temperature. I am glad that you are managing to dial in the PETG and starting to get usable results. Just for comparison below I have a part with a large bridge and support which the slicer put the bridge on the long axis. 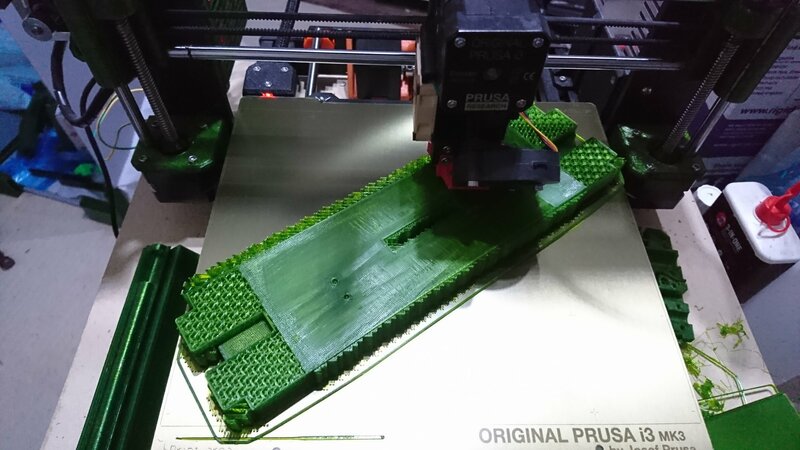 I am very suppressed that after the first layer of the bridge is seems to be working reasonably well. Well, that's the thing. I had PETG dialed in to the point that I could print large 0.1mm detail prints unattended. Then yellow filament comes along and fails at cooling. Even turning on the fan for a short amount of time while bridging breaks the print. I just tried the same prints with galaxy black, and they turn out beautiful. Just by switching the filament. Disabling the fan with either PETG variant leaves the whole print quite gooey, which can affect wall precision, so I really want to find a way to keep them running. Well, at least the frustration is out of the game, since I can blame the filament properties. From now on it can just get better.